Courtney was a “surprise baby” born here at IPPL. Her mother Michelle never showed that she was pregnant, and her father, Maui, had supposedly been vasectomized. Sadly, at just 12 days old, her mother attacked her and shattered her left leg. Thanks to IPPL’s wonderful veterinarian, Courtney survived the major surgery required to repair her leg and made a full recovery. We later realized that her mother was probably not producing enough milk and was getting upset because of her baby’s attempts to suckle which caused her pain. Because she was rejected, Courtney was hand-raised by IPPL staff, two special night-nannies, and volunteers for over six years. Her caregivers took turns feeding her, playing with her, and taking her for walks around the sanctuary grounds. 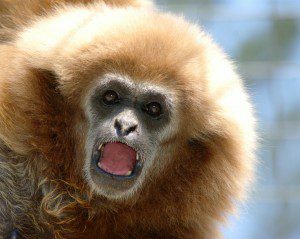 In May 2009, Courtney was paired with a former lab gibbon named Whoop-Whoop. His mild-mannered personality is a great match for her wild ways. Courtney spends most of her day swinging on her trapeze bar and begging the IPPL staff to run around the enclosure and play “tag” with her. She also loves having her back scratched. Though she had a rough start to life, her stubbornness and strong will are always apparent and are the reason she made such a miraculous recovery.